African grey parrots have an unparalleled ability to mimic human speech and other sounds. African grey parrots are native to west and central Africa. They inhabit different types of lowland forest, including rainforest, woodlands, and wooded savannah. They can be seen along forest edges and in clearings as well, and sometimes feeding in gardens and cultivated fields. African greys are kept as pets in many parts of the world and their popularity dates back centuries. They were a favored pet among the noble classes of ancient Rome. If you ever consider keeping a parrot as a pet, be aware that these are long-lived and highly intelligent birds that require considerable care and attention. They form strong bonds with their owners and can be very noisy, messy, and demanding! You can have wonderful companionship with a parrot, but you need to know what you are getting into and be willing to take on the full responsibility. The Maryland Zoo features an African grey parrot among its Animal Ambassadors that are introduced to audiences in education programs on and off grounds. African greys are gregarious, social birds that roost together at night in large flocks sometimes numbering in the thousands. They disperse into much smaller groups during the day to feed. At dawn and dusk, they can often be seen (and heard!) flying high over the treetops on their way to and from feeding and roosting sites, calling loudly all the way. They travel regular routes and their flight is swift and direct, with rapid, shallow wingbeats. African greys rarely come down to the ground. They feed high up in the treetops on fruits, berries, nuts and seeds and they are particularly attracted to the fruit of the oil palm tree. They also roost in trees or palms, often along a shoreline or on a small island in a river or lake. They use their toes – two facing back and two facing front on each foot – to help them balance and perch. They also use their beaks as a third foot for climbing and balancing. Like all parrots, African greys have short, blunt, rounded beaks with a curved upper mandible that fits neatly over the lower. The parrot’s beak is a powerful tool for cracking nuts and seeds. The African grey parrot is a beautiful silvery-grey bird with a bright scarlet tail. It has extraordinary vocal range. It squawks, whistles, shrieks, screams, and mimics. This particular species of parrot is a well-known and very accomplished mimic, but recent research suggests that they are capable of far more than just “parroting back” what they hear. They demonstrate impressive intelligence. 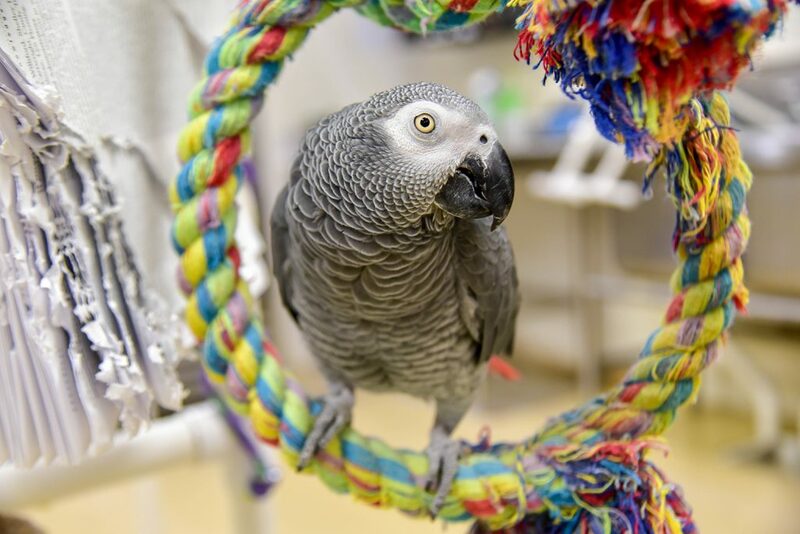 Those few African greys that have been studied closely in a research setting have shown an ability to comprehend and discriminate between colors, numbers, and shapes, and to use language purposefully to provide the correct word in response to particular questions. Most parrot species, including African greys, are monogamous and form dedicated pair bonds. This species nests in tree cavities high off the ground. Breeding pairs typically go off on their own to nest, although African greys have also been known to form loose breeding colonies of several hundred pairs. Females lay clutches of usually two to four eggs and incubate them. The eggs hatch within 21 to 30 days. Both parents care for the nestlings until they fledge – i.e. start to fly and leave the nest – at about ten weeks of age. African greys are preyed upon mainly by snakes and large cats.  To avoid predators, they will either fly away or defend themselves with their powerful beaks. They are extremely vulnerable to trapping and may also be persecuted by humans in places where they are perceived as pests because of the damage they can do to crops. 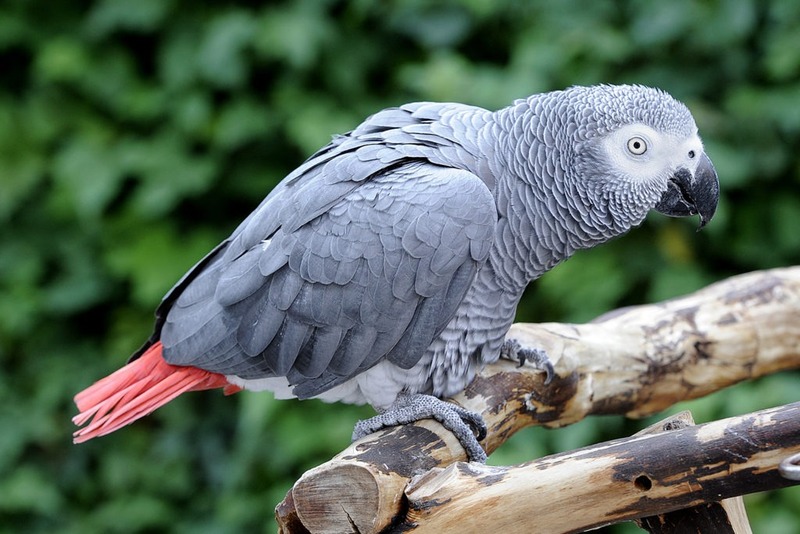 African grey parrots have declined significantly in the wild in recent decades, due primarily to excessive trapping for the international pet trade. They are also threatened by habitat loss due to deforestation in many parts of their range.